The players in my Malara campaign have recently reached 5th level and secured a relatively steady income by marrying a prostitute friend of theirs off to the royal botanist and then assassinating and impersonating said botanist (like you do). As such, they're starting to feel a bit of wanderlust. Up to this point, they've spent most of the campaign in a huge primeval forest and adjacent jungly elf empire (toward the center of the map below). So the time has finally come for me to figure out what else is out there. This is how I did that. First: codify my influences. I filled a piece of paper haphazardly with the stuff I want to influence the setting. Then, around each one, I tried to get more specific about what aspects I wanted to lift for my game. Then I moved on to the word-map below. 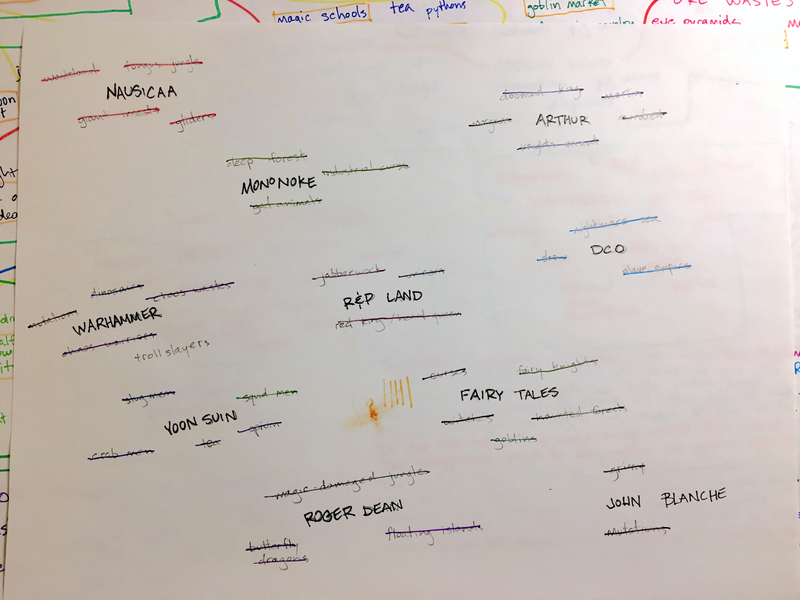 Using the influences and what I've already told the players, I named the regions of the game world. I used different colors to distinguish the regions from each other and provide a dominant mood. Around each region, I filled in words from the previous step, crossing them out as I went. Then it was a matter of making several more passes, using what was already there to free-associate more characteristics of the region. At this point I also borrowed liberally from other sources, particularly +Zak Sabbath's campaign (the prime motivation behind this). Two dungeon-like adventure locations, outlined in yellow. Eventually I hope to have 5-10 for each region (if they get visited, anyway), but at least I can quickly create these two if I know the PCs are on the way. 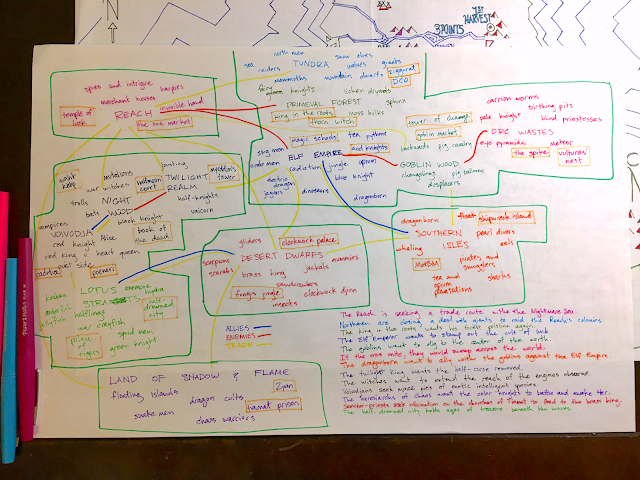 As a final step, I demarcated land, allies, enemies, trade routes, and wrote a hook for each region. 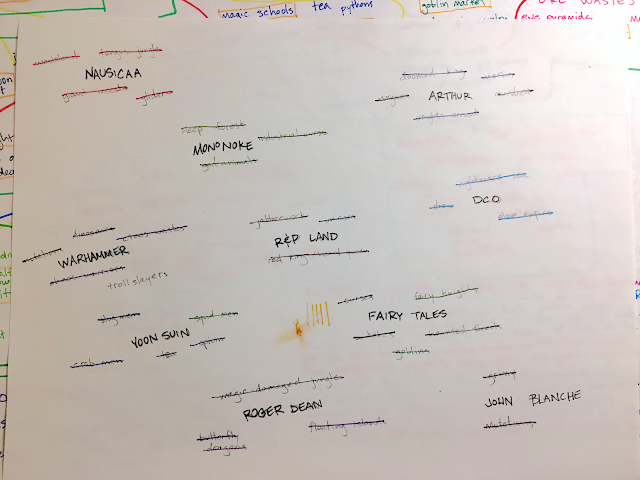 This method might be too obvious to warrant a post ("I wrote down ideas in different colors! "), but I was really happy with both the process and result. It gave me more freedom and more useful information than my usual mapmaking inclination, which is to start by outlining continents, then mountains, then rivers, then forests...and then the last step is, "Ok, so what goes here? Why do the PCs care?" Essentially, I inverted the process. Now I feel like I have a really good idea of what each location is like, and can quickly produce a map that should give the PCs enough to do until I can flesh it out some more. This is good stuff! Method not obvious at all... Feels like an elegant process for world building. I have wanted to do something similar and keep thinking I need to populate a hex map first. Your method is much better! Really appreciate you sharing your thoughts process around this!